Summer is finally in full swing – which means high temperatures are here to stay. Increasing temperatures can have a multitude of negative effects on animals that are in the sun and heat throughout the day, including horses. 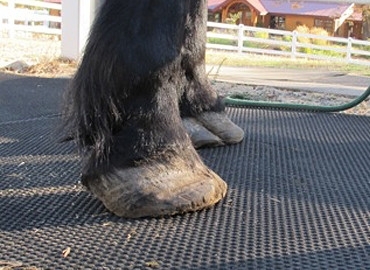 Higher temperatures put horses at increased risk of discomfort and hoof complications. During the summer season, as horses are more active, it is crucial to be cautious of their soles and hooves in order to maintain good overall hoof health. As summer sets in and temperatures start to rise, it is especially important that horses receive consistent trimming and maintenance from hoof care professionals regularly. After a lull in growth throughout the cooler seasons, hoof growth increases to its normal rate as warmer weather advances. Ongoing maintenance on horses’ hooves coincides with their overall comfort and wellbeing. Additionally, it’s equally as important to make sure that hooves aren’t wearing away too quickly. Horses that are susceptible or have laminitis, founder or thrush can benefit from pour-in pad materials to help provide extra protection and support throughout every season. The materials, such as Equi-Pak, support the boney column of the hoof and position the weight-bearing load over the entire ground surface as opposed to just the hoof wall, reducing the “pull” on the lamina and resulting in a faster recovery. Equi-Pak CS is also a fast-setting, soft pad material that is infused with copper sulfate to manage moderate to mild cases of thrush. Both products provide extra protection and support, and bond to the soles to protect them from abrasion so that they can continue to grow. Equi-Pak and Equi-Pak CS can be used on unshod horses that have Super-Fast applied, or used on shod horses to provide extra sole support. The materials can also be applied under a layer of Sole-Guard. It’s important for owners and hoof care professionals to be mindful of their horses during the summertime and provide the proper support to protect and maintain healthy hooves. Take advantage of the current Vettec promotional offer! Right now, when customers buy 11 cartridges of any Equi-Pak product, they receive one free! The promotion ends September 30, 2018.